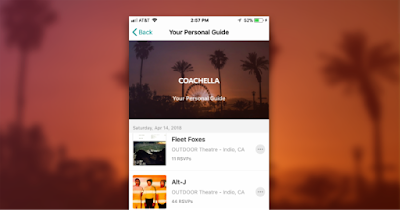 Bandsintown, the largest independent concert discovery platform, launches the first personalized festival guide for Coachella inside their mobile app. With over 240 artists performing across 9 stages at Coachella, fans can use this personalized guide to plan their itinerary based on their music taste over the festival's double-weekends extravaganza. Bandsintown's Coachella Festival Guide follows the success of their first ever data-driven personalized SXSW guide which launched in March 2018, where 45% of users RSVP'd to SXSW events through Bandsintown's Personal Guide. "There is so much incredible talent to see at Festivals like Coachella, it can be overwhelming for fans to decide who to see at any given moment" Fabrice Sergent, Bandsintown Managing Partner, said. "We want to make sure fans never miss an opportunity to discover the best artists suited to their taste, and we hope personalized guides like this help provide them with the best festival experiences possible." For those who can't make it to the festival, this year fans can live stream the festival on Youtube and use the Bandsintown Coachella festival guide as their personal streaming planner. The Coachella festival guide is available now in the Bandsintown mobile app on the App Store and Google Play, make sure to sync your music with the Bandsintown App to get the most up-to-date and relevant recommendations for Coachella! Bandsintown believes that Live music brings people together through unique communal experiences and creates happiness and understanding in the world. Bandsintown is available on the App Store on iTunes and Google Play. For more information, please visit bandsintown.com.